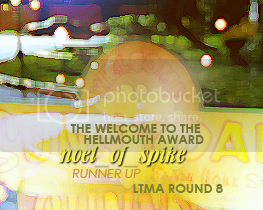 Welcome to noel_of_spike! We're celebrating Spike/William from the 16th to the the 31st of December this year, with a special holiday theme. All pairings, het, slash or gen, character studies, essays, manips, banners, icons, whatever, are welcome as long as it brings in Spike or William and a holiday theme. It may be religious, but mainly we are looking for the feeling of the holidays, not any particular type of celebration. Fresh material made specifically for posting days, please. In 2013, in addition to sign-ups for posting new material from December 16-31st, older material may be re-shared on any date December 26th-31st. LJ-cuts are necessary for everything, except a work safe small banner for your story or 3 icons to show your wares off. Let readers know the title, pairing, rating, and any possible warnings for your work. Do feel free to link your entries here on your posting day, and cross-post to your own journal, or any communities. We ask you to try to tag your posts. Information on how to tag can be found here. If you took part last year, your user name is already in our system, so you can look it up. As of December 2012 new participants' names have been added as tags. If your name hasn't been added, and you need a tag, please let vikingprincess know. Posting days are flexible. Pick your favorite day. As long as you can keep your commitment, it's all good. Because we only run a short while, it is possible we will double up on some days and feature more than one person posting. Joint posting days are also all good, as well as co-written fic and fic you do and your friend makes art for it--it's all nifty! If you need to swap your day with someone else, please drop an email to one of the maintainers. It's fine, we just want to know so we can switch anything needed. If you can't post on your day, as much notice as you can possibly give is good. We want to have as many Spike filled holiday days as possible. We are affliated with darker_spike, winter_of_angel, fall_for_spike, fall_for_sx, spuffy_art and buffyversetop5. noel_of_spike was created by jans_intentions and vamptastica. * Mods for the 2006 season were: jans_intentions and vamptastica, with memories by the amazing woman_of_. * Mods for the 2008 season were jans_intentions, vamptastica, and sueworld2003. Tags were done by vikingprincess. Weekly recap posts were done by mentalme85. Sign ups were handled by jans_intentions. * Mods for the 2009 season were jan_irving, vamptastica, and sueworld2003. Tags and memories were done by vikingprincess. Weekly recap posts were done by mentalme85. Sign ups were handled by jan_irving. * Mods for the 2010 season were sueworld2003 and vamptastica. Tags handled and memories recorded by vikingprincess. Sign ups handled by maryperk73703. * Mods for the 2011 season were sueworld2003 and gillo. Tags, memories, and recap posts were handled by vikingprincess. * The current (2012-present) community owner is sueworld2003. Moderators also include gillo, indigodiaries, shapinglight, syrenslure, vamptastica, and woman_of_. Tags, memories, and recap posts are handled by vikingprincess. Please direct any questions, comments, or helpful suggestions to vamptastica at livejournal.com or here in the community admin posts. We won for our 2006 season for Best Community at Soga! Woo! And we won for the 2007 season at the Lie to Me Awards.